Ximension is the dimension where being Xi goes without saying. It is no coincidence that the name of my company is also Ximension, although I had conceived and introduced the concept a couple of years previously. You may find the explanation at the page Acknowledge Ximension. What is Xi and how can I recognize it? What is the difference between Xi and Giftedness? Why am I suddenly recognizing it, in myself or in others? 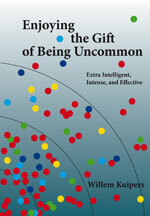 Why make such a fuss about being uncommon? What’s the use? This website can only touch upon some aspects; in my book you will find more explanations and relevant information about these subjects.